It’s a classic San Francisco story. Nearly as celebrated as their sometime companion Emperor Norton, Bummer and Lazarus were a pair of stray dogs that wandered the streets of the city’s rough-and-tumble Barbary Coast in the early 1860’s. As the story went, after Bummer had established himself as an ace rat hunter outside Martin’s Saloon on Montgomery Street, he rescued a gravely injured mutt from a fight, and nursed him back to health. Thereafter the two were a pair–and naturally, Bummer’s new sidekick’s name became Lazarus. Exempted from local laws against strays because of their notoriously close bond (and their prodigious skill in the execution of rats), the dogs were seized upon by local reporters and cartoonists of the day. And somehow, they ended up becoming part of the city’s history; you can see a plaque dedicated to the pair at the base of the Transamerica Pyramid (see photo below). 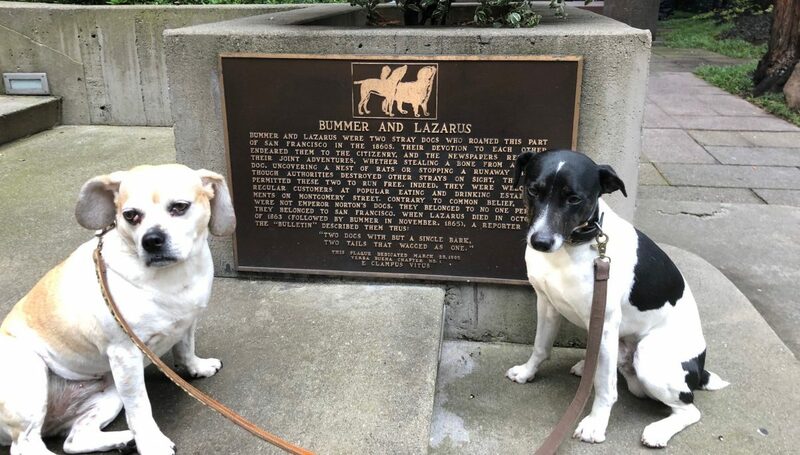 Vegas and Pepper pay homage to the even more famous Bummer & Lazarus in North Beach. In recent years, the story of Bummer and Lazarus has made the unlikely jump to the stage. 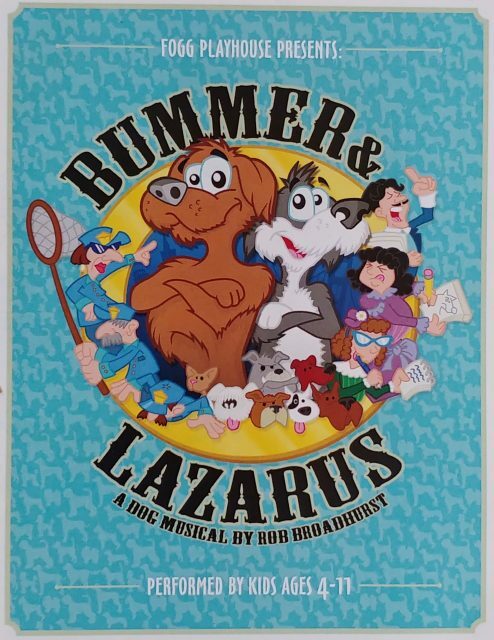 And this weekend we’ll be seeing a brand-new variation, right here in the neighborhood: Bummer & Lazarus: A Dog Musical. That’s right, we said dog musical. But don’t worry, the roles are actually played by humans: just very, very small ones. Okay, I’ll explain. In a twist, all of the roles in creator Rob Broadhurst’s new play will be performed by children between four and eleven years of age. The shows are produced by Fogg Playhouse, a local theater that provides guidance and instruction in musical theatre to the youngest of our Bay Area residents. Their goal is to get kids involved at an early age, fostering confidence, individuality and creativity. Capp Casey, a cast member of Bummer & Lazarus The Musical, rocks his Dogcatcher’s Cap at Al’s Attire. Of course North Beach takes care of their own, so the kids will be wearing elaborate period costumes onstage, provided by our very own Al Ribaya of Al’s Attire. 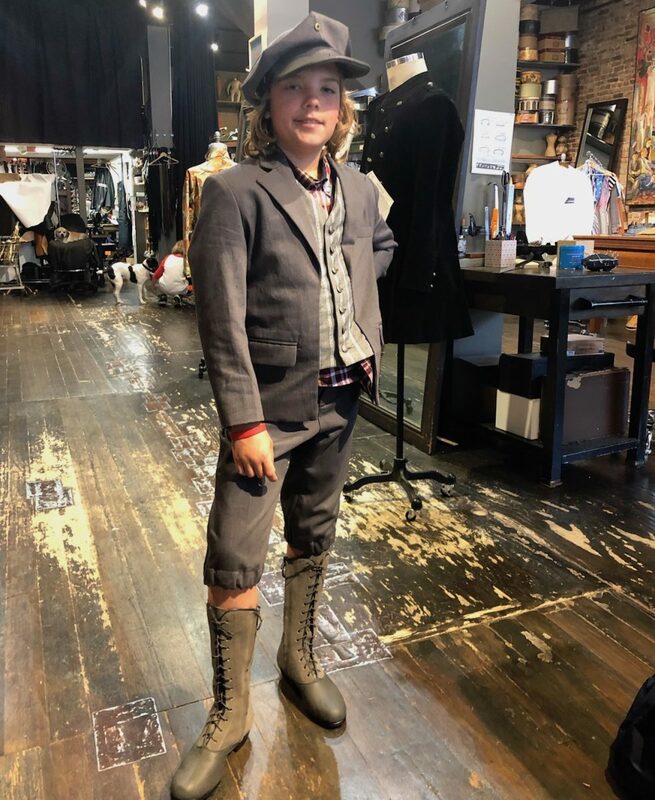 The clothier has done his homework, and the kids’ wardrobe will all hew close to the sartorial standards of the time, bringing an extra touch of authenticity to the production. Al is cosponsor of the production along with Muttville Senior Dog Rescue, a local org devoted to helping older dogs live better lives through rescue, adoption and education–a pretty admirable mission. The shows will take place this weekend at Francisco Middle School’s Little Theater on Powell Street, so get your tickets now. Showtimes are at noon, this Saturday and Sunday, April 13th and 14th. Tickets are available here.